At a book launch in Mumbai, Maria was photographed in a kalamkari sari from Second Skin. Wearing her hair down, she rounded out the look with a big bindi, jewelry from Inaayat and a Bottega Veneta clutch. Nothing to fault here; Maria looked absolutely lovely! oh, utterly gorgeous, that saree is a masterpiece! 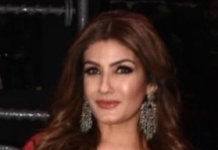 What a beautiful sari and earrings…Maria looks lovely. Love love love this! That chartreuse blouse is perfect pairing. Need to get one kalamkari for myself asap. 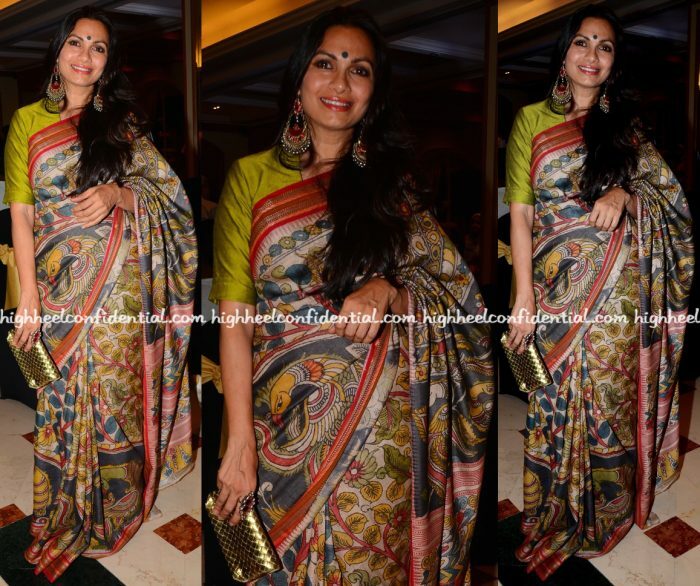 Such a gorgeous saree – I love the colors and the kalamkari print. She looks beautiful. Love how she has accessorized – her bindi, blouse, ear-ring and the purse go so well with this dominant saree. I have a similar saree, but I don’t think I have worn it so well. Gorgeous lady in equally gorgeous saree!! Who would’ve thought tomboy Maria would grow up to be a sophisticated, gorgeous woman with so much grace? Absolutely beautiful! Nobody does saris quite like Maria. A timeless stunning saree with the right pop of colour through the blouse and further colour blocked with the bindi finished with stunning chandelier earrings and that little touch of luxury with the Bottega clutch! Someone please whatsapp this image to Vidya Balan!